Martensen Wright congratulates Lars Reed, our former Law Clerk, on being sworn in as a California attorney. 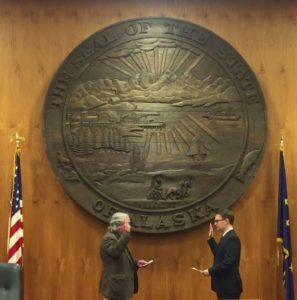 The swearing-in ceremony took place in Alaska (notice the seal on the wall in the picture), because Lars is currently clerking there for Chief Justice Craig Stowers of the Supreme Court of Alaska. Lars graduated in May 2017 from UC Davis School of Law and passed the California bar in November. Martensen Wright is proud to have been part of the beginning of Lars’ legal career and we wish him the best of luck in the years ahead.